Create pretty yearlong planning calendars in minutes. Save time and effort. Ready to use calendar template! Create good looking yearlong calendars as easy as filling in cell colors and letters into pre-formatted Excel cells. No special skills required, just regular Excel use. No formulas or other complicated stuff! No setup or security implications. This is a plain Excel file. Just open it and fill in YOUR Calendar data and details. Can the Calendars be customized? Yes. They can be manually changed as any other regular Microsoft® Excel file. 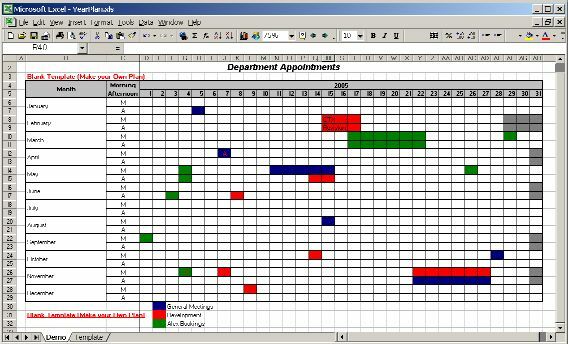 There are no special features to the Calendar file, it is a regular Excel file with painted cells. You can save it, make copies or customize at will. Universal Calendar Creating Excel Macros - Make your own Excel Calendars - Any Year, 2 Styles! Fancy that Project Style calendars (GANTT Charts) but don't have a project management software? Tired of marking events and dates with a color pen on a wall calendar? Easily make your own home and office calendars in Excel! Really easy to use, just fill in the values in the Input Cells and press the "Run" button to create several different styles of Calendars. EXCEL ONLY - No installation or setup required. Just open in Excel and run! The DEMO is a ZIP file containing 2 PDF files within. You will need to unzip it (extract the template from the compressed ZIP file). Windows XP will let you do it directly, presenting the file as folder. On older versions of Windows, you will need an extra application like the popular WinZip. You will need the free Adobe Acrobat Reader to open the included samples. PDF is nowadays the standard for publishing documents on the internet, and the is completely safe to install. There are versions for most common Operations Systems, like Microsoft® Windows, Apple® Mac and Linux. After payment at PayPal, you will get to a page with a link to download a XLS file containing a Microsoft® Excel file. Save it to your local disk. After saving, just open and use it like any other regular Excel file (remember to save the original to reuse later)! Spending full days manually making calendars? Spending hundreds on specialized software you don't know how to use? With this easy to use Microsoft® Excel file YOU will generate pretty calendars in minutes. No need to learn new software skills. Get your Calendar Template now by using one of the BUY NOW buttons on this page. How can I stay informed on Calendar products from OfficeHelp.Biz? There are plans for more Calendar related products. The best way to stay informed about them (and all our range of products) is to subscribe our Email Newsletter. You will be informed when contents updates are made and automatically granted participation on any future promotion.